Why Are All Snowflakes Different? You may have heard that no two snowflakes are exactly alike. That isn’t totally true, although the chance of finding twin snowflakes is very, very, very unlikely. Scientists estimate the chances of two snowflakes being exactly alike are about 1 in 1 million trillion (that’s a 1 followed by 18 zeros). Meteorologists think that there are 1 trillion, trillion, trillion (a 1 with 36 zeros!) different types of snowflakes. 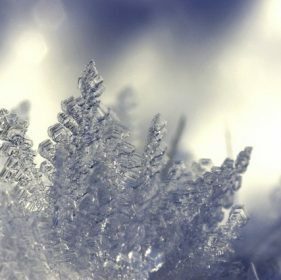 A snowflake has three basic ingredients: ice crystals, watervapor and dust. The ice crystals form as water vapor freezes on a bit of microscopic dust. The dust particles can come from many different places, including flower pollen, volcanic ash, and even celestial bodies such as meteors. Snow forms in very cold clouds containing water droplets and ice crystals. As water droplets attach themselves to ice crystals, they freeze, creating an even larger ice crystal. In any crystal, little bits called molecules line up in a pattern. In ice crystals, water molecules line up and form a six-sided shape called a hexagon. This is why all snowflakes are six-sided. The temperature of the cloud it forms in determines the shape of an ice crystal. Likewise, the amount of moisture in the cloud determines the size of the ice crystal. More moisture will create a bigger crystal. When several ice crystals stick together, they form a snowflake. As snowflakes tumble through the air, swirling and spiraling, they each take a different path to the ground. Each snowflake falls and floats through clouds with different temperatures and moisture levels, which shapes each snowflake in a unique way. Even though two snowflakes may form in the same cloud, their different journeys to the ground will affect their shape and size, giving each snowflake its own unique identity. You may never find an identical pair of snowflakes, but they can be grouped by similarities in their patterns. Explore photographs of common snowflake patterns.